A newborn gasps for a breath of air, but can’t seem to get enough. While tremors and tics disturb her gaunt, fragile form, cries emanating from her weakened lungs simply cannot be consoled. Painful diarrhea and difficulty eating add to a long list of symptoms that plague this helpless one made in the image of God. Something is wrong. Something is very, very wrong. No baby should ever come into this world dependent on the drugs of her mother’s addiction. Yet, the mother doesn’t need more shame and guilt. So in Paragould, Arkansas, the House of Virtue has stepped in to love these mothers and their infants with the love of Christ—and put a serious dent in drug dependency. Ten years ago, Danielle Edgar volunteered to babysit for a women who would be sentenced to a five- to eight-month prison term. 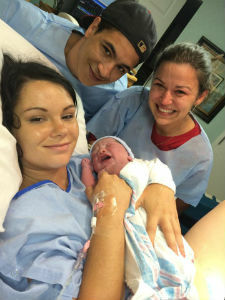 The young woman had a seven-month-old boy, and was also in her fifth month of another pregnancy. Danielle ended up accepting full custody of both of the babies prior to her prison term. During that time, she discovered for herself the trauma experienced by a baby born with a drug addiction. In a sad turn of events, the mother rolled over her newborn daughter at five weeks, causing her to suffocate. When this mother became pregnant yet again, she decided she’d had enough—she knew had to find help. Moved by the Holy Spirit, Danielle found a place for this young mother to go where she could live and find freedom from her addiction. The eye-opening ordeal planted a dream within Danielle’s heart to start a home for pregnant women in crisis. Danielle is the husband of Kevin Edgar, who serves as senior pastor of First Church of God in Paragould. She is also an ordained minister serving alongside her husband at the church, but now also directs the House of Virtue. The home has sheltered, cared for, and begun the process of restoration in numerous lives since its inception just over a year ago. Eight women and five babies currently reside at House of Virtue, but at one time, twenty-four residents packed the house. Some live there by court order, others come from jails. All start out with little or no hope to their name, but grow to discover that hope is available to them. Doing the work of the Lord is rarely glamourous. Truly following the Spirit’s leading, by faith, rarely takes us to lofty places of material prosperity and carefree living. Instead, our hands have to get a little dirty, and we may get a little roughed up (and in some cases, give up our lives). For Danielle, getting House of Virtue off the ground was anything but smooth. “I have been through many different spiritual battles in my twenty-six years of ministry, but never have I experienced the trouble and strife to compare to this year after starting the House of Virtue,” she explains. One steep mountain lay ahead of Danielle early in her journey with the new ministry. Their first resident, a “hardened street junkie,” as Danielle explains, was caught in the middle of a court battle over her son who had been put in foster care. Just one month after House of Virtue opened, the same court battle led to an attempt to disqualify the ministry as a drug rehabilitation center for pregnant women. Then, two months into operation, the city inspector ordered the installation of a $10,000-dollar sprinkler system, or the ministry would face eviction. The ministry had to relocate, and Danielle also suffered a broken friendship in the process. Looking back, Satan was clearly trying to thwart God’s plan for House of Virtue. And while the battle scars remind the volunteers of an especially difficult season, House of Virtue is alive today, saving lives, and restoring hope in the name of Christ. “Eight drug-free babies have been born since last April,” Danielle recounts. Visit www.JesusIsTheSubject.org to learn more about how the Church of God is changing the world by making Jesus the subject. This entry was posted in All Church of God, Central and tagged Arkansas, baby, community, crisis, Danielle Edgar, First Church of God, girls, ladies, outreach, Paragould, pregnant, Refuge, shelter, women. Bookmark the permalink.